When you need to know which cells are undifferentiated, such as for monitoring pluripotency status, performing quality control of stem cells, or measuring alkaline phosphatase (AP) activity in situ, SBI’s AP Staining Kits are specific, sensitive, and reliable tools that can provide answers in as little as fifteen minutes. Unlike other pluripotency markers that are only present in certain subsets of undifferentiated cells, AP is highly active in embryonic stem cells, embryonic germ cells, and induced pluripotent stem cells, making it a universal pluripotency marker. The Blue-Color Alkaline Phophatase Staining Kit is a histochemical assay for use on cells grown in tissue culture wells or dishes, and includes both substrate and dye for colorimetric read-out of enzymatic activity. 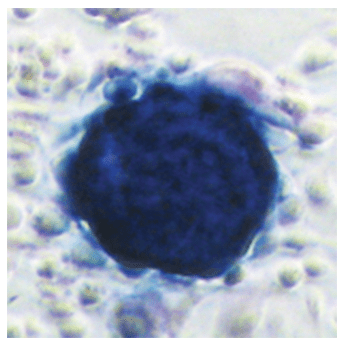 The AP-positive, undifferentiated stem cells stain blue, with color developing rapidly. The stain does not fade and stained samples can be kept at 4°C for up to one week. Figure 1. SBI’s AP Staining Kits can stain pluripotent cells either blue (Blue-Color AP Staining Kit, Cat.# AP100B-1) or red (Red-Color AP Staining Kit, Cat.# AP100R-1). Figure 2. Easily distinguish pluripotent cells from differentiated cells with SBI’s AP Staining Kits.